Before Google Chrome entered the scene and subsequently dominated the market, Firefox trailed only Internet Explorer as the most popular web browser. Now, Mozilla has its sights set on a new opportunity to revive its browser for immersive experiences. In a blog post on Tuesday, Mozilla announced that it will bring the Firefox Reality web browser to "next generation" augmented and virtual reality headsets. In the meantime, the source code for the browser will be available for developer modes on Daydream and Gear VR devices. Built from scratch for immersive environments, Mozilla has married its experimental Servo web engine with its new Firefox Quantum browser. 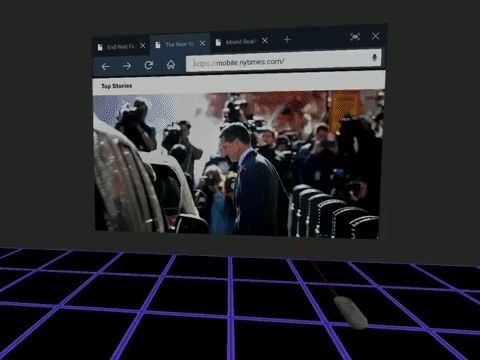 In a demo video, Mozilla showed off the browser's UI in VR. "From the Servo team (who recently joined the Mixed Reality team) we will gain the ability to experiment with entirely new designs and technologies for seeing and interacting with the immersive web," wrote Trevor Smith, an augmented reality research engineer for Mozilla, in the blog post. "This is the first step in our long-term plan to deliver a totally new experience on an exciting new platform." As development continues, Mozilla plans to share its progress. Over the next few weeks, the organization is planning to offer previews of Firefox Reality operating on various pre-release headsets, demonstrating experimental computer vision capabilities and interaction features using devices, gestures, and voice. Mozilla clearly wants to lead the way to the web for augmented reality, currently jockeying for the lead position versus Google to bring web-based AR experiences to mobile devices. Mozilla is also planning to experiment further with web browsing as an early access development partner with Magic Leap.